Well, this definitely isn’t in the Torah. 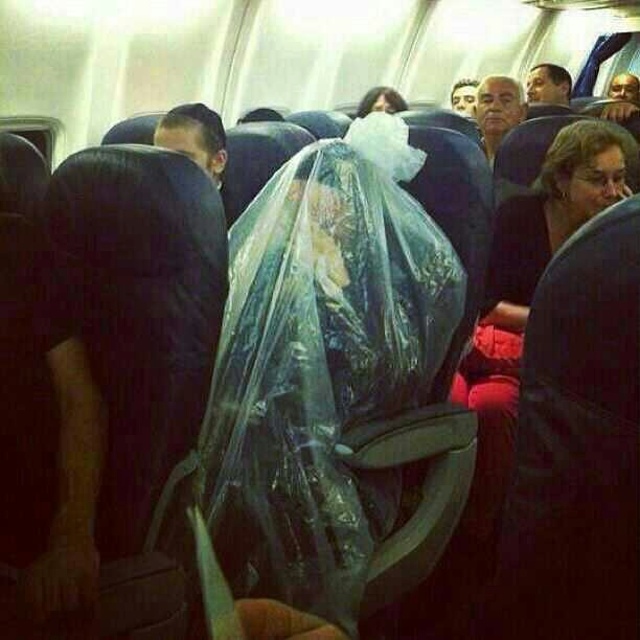 Yesterday, a redditor posted this image of a Chasid wrapped in a plastic bag aboard an airplane. The poster assumed it was to avoid touching women, which while TOTALLY INSANE, is not really that crazy an assumption. Another was quick to point out that this was likely a Kohen (or priest) protecting himself from the impurity he’d pick up from flying 40,000 feet over a cemetary. And that this solution was prescribed by the venerable Rabbi Yosef Shalom Eliashiv. OK! Isn’t kind of a suffocation hazard? What will this dude say when his children start hanging out in plastic bags and tell him “we learned it from watching YOU!”? This entry was posted in Media, Musings and tagged airplane, cohen, hasid, humor, jew, jewish, judaism, kohen, lol, omg, priest, religion, religious, wtf by omgwtfbible. Bookmark the permalink.